Plant-made vaccines are now a well-established and well-tested concept in veterinary medicine—yet the only product so far licenced was never produced commercially. This is puzzling, given the breadth of exploration of plant-made animal vaccines, and their immunogenicity and efficacy, over more than twenty years of research. The range of candidate vaccines that have been tested in laboratory animal models includes vaccines for E. coli, Salmonella, Yersinia pestis, foot and mouth disease virus, rabbit haemorrhagic disease virus, rabbit and canine and bovine papillomaviruses, mink enteritis and porcine circovirus, and lately also bluetongue virus, among many others. There are many proofs of efficacy of such vaccines, and regulatory pathways appear to have been explored for their licencing. 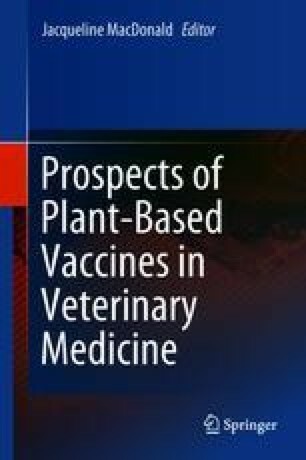 This review will briefly explore the history of plant-made vaccines for use in animals, and will discuss the unique advantages of plant-made vaccines for use in a veterinary medicine setting in detail, with a proposal of their relevance within the “One Health” paradigm.